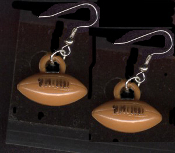 Mini Funky Vintage FOOTBALL CHARMS EARRINGS - Sports Cheerleader 3-d Charm Costume Jewelry - Tan Brown pigskin color miniature dimensional plastic new old stock gumball vending charms, each approx. 7/8-inch (2.19cm). Great fan, player, team Mom, Dad, coach or referee gift. Show support for your favorite primary school, high school, college or NFL team!